Thirteen days ago Betty and I left San Antonio, Texas, after the completion of the 2016 Khe Sanh Veterans reunion. 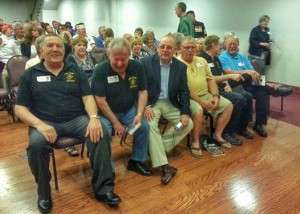 We were glad to see all our Khe Sanh Veteran friends, and to meet some folks we hadn’t met before. We were also saddened because a lot of the men in BRAVO!, a number of whom we interviewed in San Antonio at the same location in 2010, were not able to be with us for a number of reasons. We did get to see and visit with John “Doc” Cicala, Frank McCauley and Tom Quigley who are in the film. As always, it was great to talk about the present and to remember the past. It is especially nice to sit and talk to men who are the only ones who understand what one went through at Khe Sanh. Besides Doc Cicala and Frank McCauley and Tom Quigley, we also got to spend time with Marines and Corpsmen of Bravo 1/26, Bruce “T-Bone” Jones, Mike McIntyre, and Jim “Doc” Beal. What a heartening time we had with these fine men. After all these years we tell our tales, our eyes big, sometimes with the faint acceleration of the heartbeat. Sometimes we slap a table top and laugh, some somber and dark moment remembered because of the black humor we employed to mitigate the constant fear that ground inside our guts. Marines and Corpsmen of Bravo, 1/26. Left to Right: Ken Rodgers. John Cicala, Bruce Jones, Jim Beal, Mike McIntyre. Photo courtesy of Betty Rodgers. While in San Antonio visiting with our friends and comrades, we spent some time working on our new project, a documentary film about the wives of combat veterans. The working title for this new effort is I MARRIED THE WAR. We met with a woman whose husband, whom we also spent time with, served during the Middle East war. In addition, we met a couple who have been married since he came home after the war in Vietnam. In addition, we also visited with a woman from the east coast whom we will interview about her experiences as the spouse of a Khe Sanh vet. On our journey down to San Antonio from our home in Idaho, we managed to stop and spend a few moments of reflection at the Vietnam Veterans Memorial in Angel Fire, New Mexico. 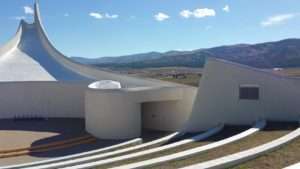 The memorial is a somberly beautiful structure that seemed to fit in an almost ungainly way against the flaming autumn colors of the surrounding Sangre de Christo Mountains. It wasn’t a complementary fit between the memorial and the red, golds and russets of the aspen and cottonwoods and maples and oaks. It was something more with a hint of irony. The memorializing of something horrible in contrast with something beautiful. The man-created versus the natural, and the stark dissimilarity between the two, was quite marked and emotionally attractive. Betty and I also had the opportunity to spend some time with our longtime friends from Central Texas, Mary and Roger Engle. We got to visit with Gregg Jones, author of LAST STAND AT KHE SANH. Gregg was in town speaking to a group associated with B-24 crews from World War II about his upcoming book concerning the B-24 Liberators of World War II. The 2016 Khe Sanh Veterans Reunion was a fine experience, and on the road home, as always, we made time to stop and spend some moments taking in the locales we passed through. Particularly meaningful was the opportunity to journey off the more beaten paths of freeways and national highways and go to Pleasant Hill, New Mexico, in search of the grave site of Ken Pipes’ great-grandfather, Andrew Jackson Pipes, who is buried in the Pleasant Hill Cemetery. Ken Pipes was the Skipper of Bravo Company, 1/26, and is dearly revered by the surviving men who served under him. 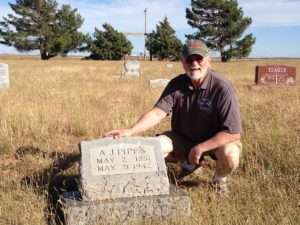 Ken Rodgers at the grave site of A J Pipes in Pleasant Hill, New Mexico. Photo courtesy of Betty Rodgers. Pleasant Hill isn’t a town, it’s a community of farmers and cattle ranchers near the border with Texas. The locals congregate around a fire house, a church and the cemetery which are all separated by a quarter or half section of farm or grazing ground. The land is flat, part of the high plains where the wind loves to blow and you can see for miles. We did find the Skipper’s great-grandfather’s grave, and it has been well maintained. One of the many other ironies and coincidences I thought about on the trip was how, in the 1980s, I used to hunt pheasant at Pleasant Hill, New Mexico. At the time I had no idea the Skipper had relations buried in the cemetery there. 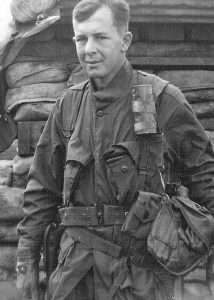 I didn’t know anything about the Skipper other than he had led us through the Siege of Khe Sanh and he let me leave Khe Sanh a day earlier than my orders allowed. 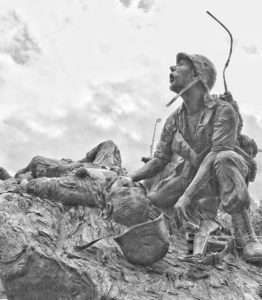 I can see him now in my mind as I recall him then, sitting in the Bravo Company command post, his arm in a sling and other parts of his body bandaged in clean white material already smudged with the blood red mud of Khe Sanh. Adding to the eerie air of coincidence is the notion that my great–grandfather was also named Andrew Jackson, last name Rodgers, who also hailed from the same region as the Skipper’s Andrew Jackson. Vietnam Veterans Memorial in San Antonio, Texas. Photo courtesy of Ken Rodgers. And then it was home for a time to get caught up before we move on with BRAVO! And I MARRIED THE WAR. Notes on the Springfield, Illinois Screenings of BRAVO! Last week Betty and I flew into Chicago, rented a car and drove down to Springfield, Illinois, the burial place of our 16th president of the United States, Abraham Lincoln. We traveled there as the guests of the Staab Family and to screen BRAVO! at the Hoogland Center for the Arts as part of a Flag Day benefit for the planned Oak Ridge Cemetery Purple Heart Memorial in Springfield. We arrived in town and were met by BRAVO! Marine Tom Quigley, a native son of Springfield who was instrumental, along with PJ Staab and the Staab Family, in making these events happen. 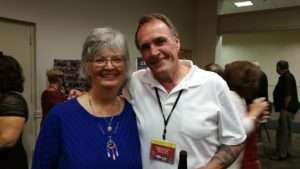 The next morning, Betty and I met Tom at the Abraham Lincoln Presidential Library where Tom and I were interviewed by local radio personality Jim Leach of WMAY radio. Betty, Tom and I were impressed with Jim’s knowledge of the Vietnam era and the Siege of Khe Sanh in particular. You can hear the interview here: http://wmay.com/assets/podcasts/20140612jlsBravo.MP3. Later, Betty and I walked down to the Hoogland Center for the Arts where we met with their events manager, Vanessa Ferguson, and checked out the facilities for the screening. On the way back to the hotel, we stopped in at the First Presbyterian Church and looked at their seven fabulous Tiffany stained glass windows and the pew where the Abraham Lincoln family sat during church services. 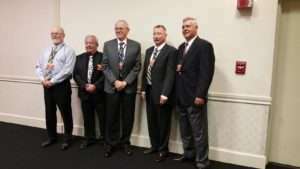 Left to Right: Tom Quigley, John Cicala, Michael E O’Hara, Cal Bright, Ben Long and Bruce Stuckey. During the day, Bruce & Francine Jones and Bruce & Judy Stuckey arrived. 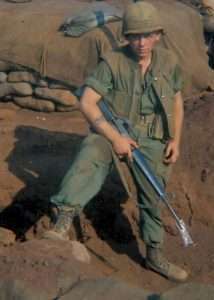 Bruce Jones, alias T-Bone, was a radioman for 81 Millimeter Mortars and spent a lot of time on patrol with Bravo Company. 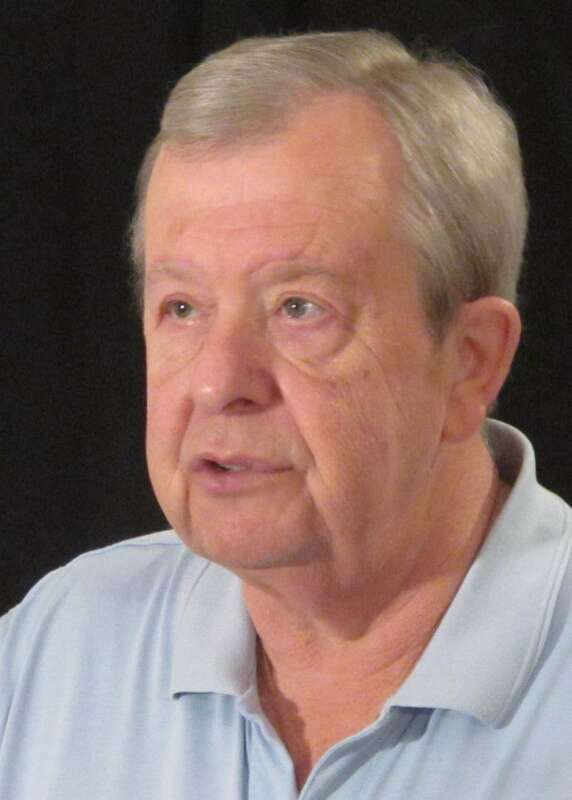 Bruce Stuckey was a radio man for Bravo Skipper Ken Pipes. That evening, we all went out for dinner at Saputo’s Italian Restaurant where we were joined by Tom’s wife Nancy and daughter Erin Parsons and her family. If you are ever in Springfield, I suggest you try the fare at Saputo’s. It is rumored that Al Capone liked to dine there, and as we tucked into our ravioli and manicotti and other dishes, I imagined seeing Al parade in with his entourage, all wearing natty summer suits and two-toned fancy shoes, ladies of the night hanging onto their arms. Also arriving in Springfield later that night was BRAVO!’s associate producer, Carol Caldwell-Ewart. The day of the screening, Betty and I and BRAVO! Marine Michael O’Hara, who had arrived early that morning, toured the Abraham Lincoln Presidential Museum—definitely worth the fees and the time it takes to watch the films, view the exhibits and look at all the memorabilia. BRAVO! Marines Cal Bright and Ben Long with his wife Joyce, and John “Doc” Cicala who was one of Bravo Company’s corpsmen, arrived that day too. We all met at the Hoogland before the screening and had a moment to visit while Carol, Betty and I worked with the staff to make sure everything was in order. The very capable A/V tech estimated that over 300 folks came out to donate funds to help build the Oak Ridge Cemetery Purple Heart Memorial and to watch BRAVO!. The evening started off with a reception hosted by the Staab Family. Right before the film was shown, Master of Ceremonies PJ Staab introduced all of the Khe Sanh vets in attendance, and we were honored by an enthusiastic standing ovation from the audience. I haven’t ever been honored like that since my return from Vietnam in 1968. You must recall that the Vietnam Veteran wasn’t particularly popular back in the late 1960s and early 1970s. Somehow we were blamed for our political leaders’ decisions, so the standing ovation was particularly heartwarming. And the ovations didn’t stop there! We were also honored at the end of the film as the credits ran, and yet again before a snappy and informative Q & A session that followed. 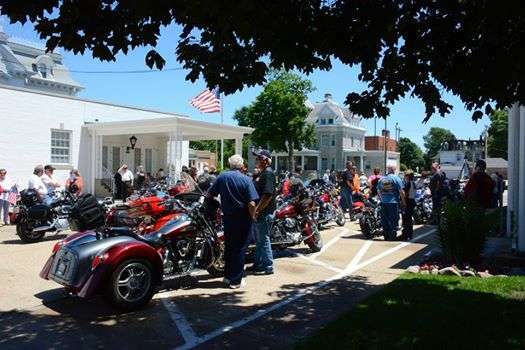 The scene at Staab Funeral Home in Springfield, just before the Ride in Honor bike run. Photo courtesy of Betty Rodgers. The next morning, all of the BRAVO! folks met for a special breakfast and then as some headed home, five us—Michael E. O’Hara, John “Doc” Cicala, Carol, Betty and I—traveled over to the Staab Funeral Home where lines of motorcycles threaded across the parking lots in anticipation of the annual Ride in Honor, a bike run to four of the area’s veteran’s memorials. I had never been around one of these bike runs—I’ve heard about them—so it was exciting to see all the bikes with their multi-hued frames and the colorful characters who were riding them. Again, the bikers chipped in funds to participate in this event with the proceeds going for the Purple Heart Memorial. Just prior to the run, PJ Staab invited us to meet his Aunt Catherine, the last of the World War II era Staab generation. We of course said, “Yes,” and followed PJ upstairs to visit with Aunt Catherine for a while. And what a delight! She’s seen the film twice and wanted to meet us. Then it was off in a roar of engines to the veteran’s shrines, the first being the Oak Ridge Cemetery where the planned Purple Heart Memorial will be built. Also located at Oak Ridge is President Lincoln’s tomb as well as commemorative tributes to the men and women who fought and died in World War II, Korea, and Vietnam. Michael E. O’Hara, Doc Cicala, Bob Cowles, Tom Jones and I made up a detail that placed a wreath on the Vietnam War Memorial. I have never been a part of anything like the placing of the wreaths, so it was humbling to be a participant. Both Bob Cowles and Tom Jones have been instrumental in getting the Purple Heart Memorial project off the ground. Betty and I first met Bob Cowles, a US Army veteran of the Vietnam War, when he arranged for us to interview Tom Quigley for BRAVO! in 2010 at the Springfield VFW Post. 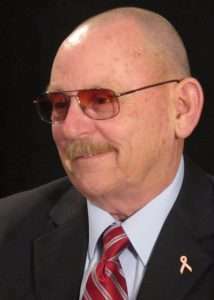 Tom Jones, also a Vietnam Veteran and Navy Corpsman who served with Force Recon, is the author of the novel LOST SURVIVOR about an African-American’s journey to fight in Vietnam. Left to right: Bob Cowles and Tom Jones. After placing the wreath at Oak Ridge, we proceeded to travel to the memorials at New Berlin, Spaulding and the National Veterans Cemetery at Camp Butler where we again placed wreaths at each location. 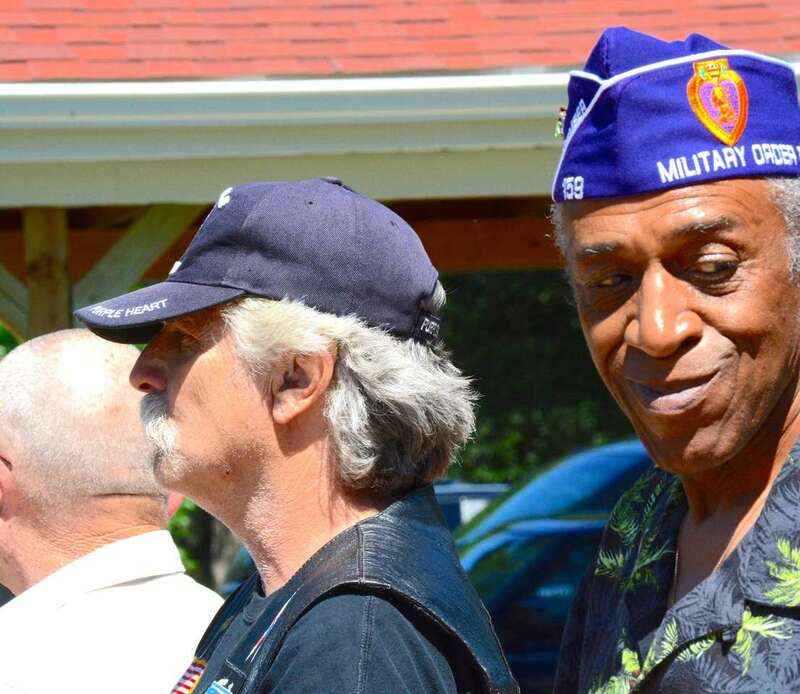 We were treated to a poetry reading and to a trumpet rendition of “Taps.” Before departing Camp Butler, the crowd of bikers lined up and hugged and thanked each one of us for our service. It was intimate and humbling for each of us. For a generation of veterans who were pretty much shunned by their country, it is amazing, after 46 years, to be getting some thanks for what we did. We were young then, and wanted to do what was required, and we wanted to do it well. We finished the day with another trip to Saputo’s, this time with PJ Staab and his lovely wife Ruth. For me it was sausage and peppers with a side of spaghetti. And they got the red sauce right. Thanks to PJ Staab and the Staab Family, to Jessica McGee, to the Marine recruits who acted as ushers at the screening of the film, to the Hilton for our lodging and the Hoogland Center for the Arts for a screening venue, to all the folks who came to see BRAVO! and to Springfield with its wonderful memorials. And thanks to Carol Caldwell-Ewart and to the men of Bravo and their wives for traveling to participate in this special weekend. If you would like to host a screening of BRAVO! in your town this summer or fall, please contact us immediately. BRAVO! has a page on Facebook. Please “like” us and “share” the page at https://www.facebook.com/Bravotheproject/. It’s another way you can help spread the word about the film and what it is really like to fight in a war. In this installment of Meet the Men, we get acquainted with John “Doc” Cicala. “Doc” lived in St. Clair Shores, Michigan when he enlisted in the Navy. “Doc” Cicala served as a Corpsman with Third Platoon, Bravo Company, during the Siege of Khe Sanh. At the “ripe old age of twenty-one,” he was the second oldest man in Third Platoon. After a forty-four year career with Chrysler Corporation, “Doc” retired, but he didn’t like retirement, so he went back to work for Chrysler as a contractor, where he now works on specific problems where his experience pays off. He also trains Chrysler employees. Besides still helping out with his old company, “Doc” is a “classic car nut.” His highlight right now is a restored 1967 Plymouth GTX.